This extraordinary sketch would have been produced during the Group of Seven's 1919 autumn boxcar trip to Algoma. These sketching trips have become legendary - members of the Group, which on this trip included A.Y. Jackson, Lawren Harris, J.E.H. MacDonald and Frank Johnston, took a fully outfitted boxcar up the Algoma Central Railway, pulled off on a siding, and proceeded to explore and sketch the surrounding mountains, lakes, forests, rivers, swamps, cliffs and canyons. All agreed Algoma was a painter's paradise, and they worked feverishly to capture what they saw. In a Canadian Forum article, Jackson wrote enthusiastically, "From sunlight in the hardwoods with bleached violet-white tree trunks against a blaze of red and orange, we wander into the denser spruce and pine woods, where the sunlight filters through - gold and silver splashes - playing with startling vividness on a birch trunk or patch of green moss. Such a subject would change entirely every ten minutes…." 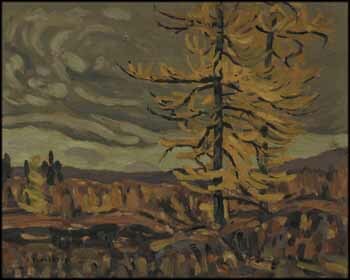 Richly pigmented with autumn colours from the carpet of ground vegetation to the golden tamarack trees, this fine Group period sketch revels in the beauty of fall in Algoma.